News that Istrouma High’s return to varsity football will begin with Bogalusa High next September is sure to bring back lots of memories from alumni of both Istrouma High and Bogalusa High. The rivalry between Istrouma in Baton Rouge and the Bogalusa High Lumberjacks spanned more than 30 years. For much of that time, they competed as members of District 2-3A, perhaps the toughest district in the state. The period included the glory years of Istrouma football when the Indians won eight AAA State Championships over an 11-year period. 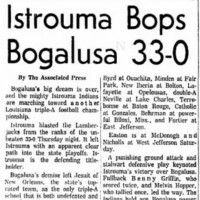 During that time, Bogalusa had many great teams but few were able to defeat Istrouma. As one fan said, it was as if Istrouma had a voodoo that Bogalusa simply could not overcome. In the 1955 season, Istrouma’s legendary Billy Cannon was a high school All-American. He humbled the Lumberjacks with a touchdown score on Halloween Night. The film of that run was paired with that of his iconic Halloween run for LSU against Ole Miss in 1959. The films of those two runs were edited together and were aired thousands of times across the country. 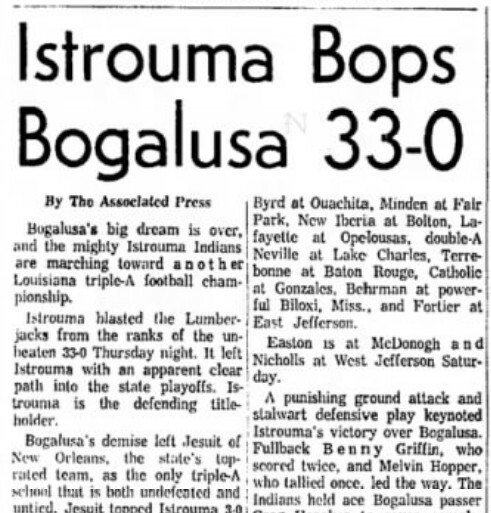 In 1962, Bogalusa had one of its greatest teams and were undefeated going into the Istrouma game. However, the Indians crushed their hopes for a championship by an impressive score of 33-0. For Istrouma, Bogalusa was considered a tough rival, but for Bogalusa, Istrouma was a terror, a nightmare, and a place of shame where dreams died. Frank A. Holmes. I’m so Bogalusa that I remember that game in 1955 when the Istrouma Indians led by Billy Cannon beat our Lumberjacks something like 48-0. Steven Hunt. They took Cannon out because he scored too much! Bill Dudley. I was there and 11 years old. I remember asking someone who that was. Was it cold and rainy that night or am I confusing it with another Cannon game? Teddy Drummond. That’s one you should try to forget. Frank A. Holmes. A scary day! C. Louise Goldsby. They used to show the Istrouma run against Bogalusa every Halloween on the anniversary of the Ole Miss game when he did the same thing. The Bogalusa run was at the start of the video. Jimmy Lea. Yeah great players. I thought we had a chance, for once. L. Larry McPhail, Sr. I was at Pearl River Community College that year and the guy in the next room was from Istrouma and played there. Every day before and after the game, he wore his Istrouma letterjacket and just rubbed the “I” on it and would just smile. I knew we had it that year. By the way, he told me at Istrouma practice they had a board with big Tank Powell’s name on it, and everyday all the players would hit it!. Myrna Carter Jones. When Cannon’s run was over, his shirt was completely gone. Nothing left but pads. George Bateman. I was there in the Bogalusa Band. Before the game got started, an Istrouma player ran over cheerleader Anna Belle Holloway, and she had to be carried off the field. Robert Lawrence. When I was at the Bogalusa Daily News, AAA was the highest classification in the state, and Bogalusa played the big boys — Istrouma, Baton Rouge High, Holy Cross, Glen Oaks, Broadmoor, and others. I remember a lady chiding Istrouma coach Big Fuzzy Brown for running up the score on Bogalusa after a home game in the early 1960’s. Brown replied, “Lady, people came to see the horses run!” I happened to be standing right there when he said it..
Rodger Talley. Yep, I still remember the sinking feeling that night..
Cliff Morris. Some games one never forgets. Robert Lawrence. I remember the bus ride home being strangely silent. Linda Russell Lewis. I remember the Lumberjacks were undefeated and Istrouma was the only game we lost 33-0. We couldn’t break that voodoo.